Members of the mock trial team gather in the court house. Photo courtesy of RM mock trial team. On the evening of March 7, the air was tense. 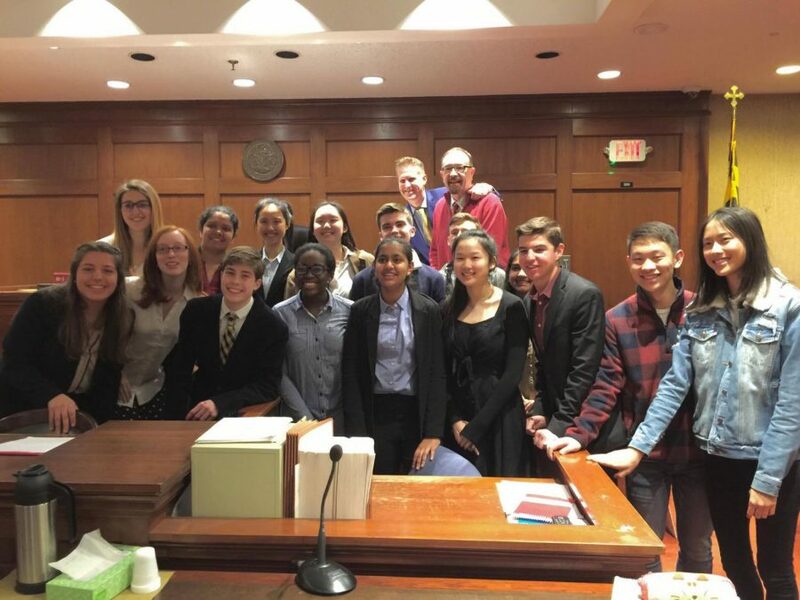 The mock trial teams of Richard Montgomery and Bethesda Chevy-Chase had just competed against each other in the Montgomery County Championships. Out of a possible score of 60 points, with RM receiving 56 and BCC receiving 53, the RM mock trial team became the county champions. Furthermore, senior Gillian Smith, an attorney, was elated at the news. “We had actually thought we’d lost, so when the judge ruled in our favor, I cried tears of joy. It was surreal,” Smith said. The RM mock trial team is composed of eighteen members, six attorneys and six witnesses, with the remaining six acting as alternates to fill in a role whenever a witness or attorney is unavailable. The witnesses present the events of the case, while the attorneys question their credibility in developing their theory of the case, among other factors. The attorneys need to be able to use their own witnesses, and opposing witnesses, to the best of their ability. The twelve attorneys and witnesses are split into two groups; one representing the defense, and the other representing the prosecution. With three attorneys and witnesses on each side, the defense and prosecution teams compete against their counterparts, competing to convince the judge to rule in their favor. This season, mock trial teams across the state have been analyzing the cyberbullying case, Maryland v. Tannen, since November and have competed against each other since January. Managed by MYLAW, the Maryland Mock Trial association for high schools in the state , the case analyzes the harassment and bullying allegations made by the plaintiff, Marty McFly, represented by the state, against the defendant, Bill Tannen. At least once a week, the mock trial team travels to the Montgomery County Circuit Court located in Rockville, a couple blocks away from RM, to perform their case in a simulated court setting in front of a professional attorney or judge in the Maryland judicial system. The RM mock trial team competed in the circuit championships in Frederick, Maryland on March 19. The team won their match and will now compete in the district championship, possibly progressing to the state championships. “We work so hard and hard work always pays off,” Smith said. The mock trial team last won the State Championships in 2014, and the team is ready to win again. “Everyone who was on the team last year wants to take revenge,” Haupt stated, “and I think we have the right mix of people to do it. Last year, the RM mock trial team won the county championships 57 to 56 and continued on to the district championship, then to the state championships. Unfortunately, RM lost in the state finals by a tiebreaker point and ended up second in Maryland. “I’m hoping we can make it through to states again and avenge last year’s loss,” stated junior Aidan Goldenberg-Hart, a witness on the team. Other members of the team, like junior Eli Protas, a witness, are wishing the same as Goldenberg-Hart. “I’ve never seen the states competition but I’m confident that we’ll do really well,” Protas said. The team is excited about their recent win and how much they have grown as a team. “I’m most proud of how capable our whole team is at creating a cohesive message during a trial,” Protas said.